Freecheat is not a plug-in that is used only for cheats, but also is used for many more things because it is a plug-in in one, works in commercial games on the XMB and PSX games up. It is a plug-in that contains many features because it contains many plug-ins as remotejoy, USB.prx, CWCheat, among others .... This plug-in also lets us know the percentage of remaining battery and space on our memory stick. And best of all, being a plug-in is not dangerous because it does not touch the flash of your PSP. Search: A viewer of memory with hex support and option to change the display mode. Codes: A code search, similar to CWCheat. MEM Manager: Repair corrupt saved data. TXT Reader:. Txt files less than 20MB. PIC Viewer, Photo Viewer. You can view BMP - JPG - PNG - DAT - JDT. 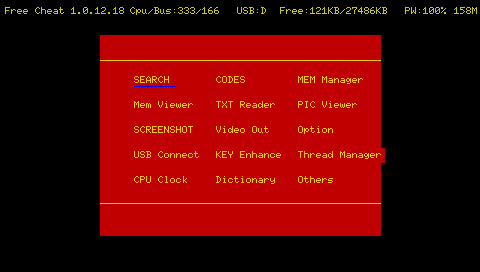 SCREENSHOT: To take screenshots in BMP - PNG - JPG. Video Out: Power display the PSP screen on your PC by remotejoy. Options: Allows you to configure shortcuts by buttons, colors, capture mode, among others. USB Connect: Allows you to connect to a PC with USB during a game. Key Enhance: Allows you to change buttons and calibrate the analog stick. CPU Clock: Changing the CPU speed. Dictionary: Dictionary, an option not included. Other: Allows you to adjust brightness, set the alarm, Shutdown, Restart, among others. Find download links for Freecheat below.